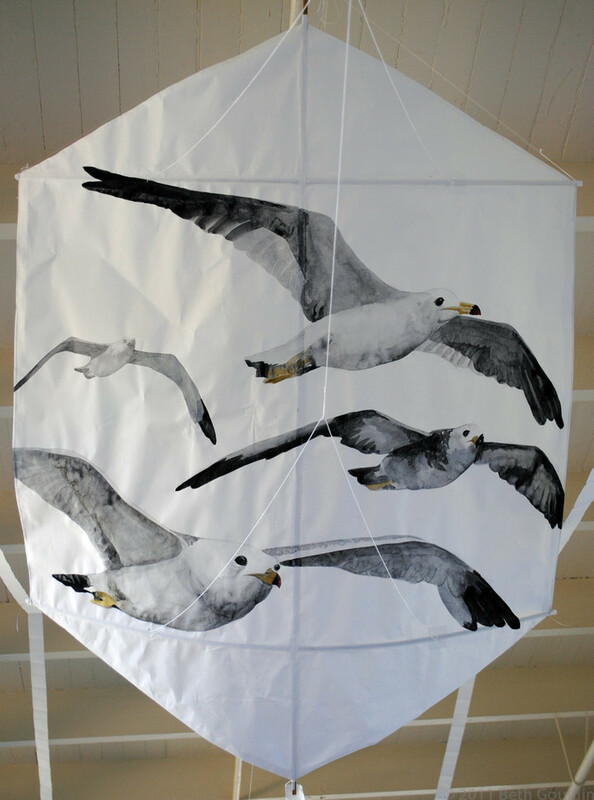 Rokkaku kite-masa/washi, bamboo, nori paste, cotton string Painting – watercolor and gouache Approximately – 30”x40” $400 “Finding Nemo,” a wonderful Pixar animated film, has forever embedded their characterization of seagulls into my mind. Anytime now I come across these birds, my brain changes their call to “MINE! MINE!” They are particularly aggressive and fearless near Fisherman’s Wharf where the tourists have unknowingly, or knowingly, encouraged their marauding behavior. The only time I really can enjoy their presence is during a ferry ride across the bay. It’s fascinating to watch the dynamics of flight in motion at eye-level as they coast along the wind currents created by the boat. Often, they will display stunning aerobatic feats if you toss a cracker or other morsel to them in the air.